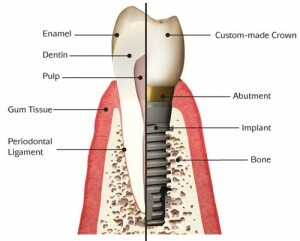 Thinking of getting dental implants in Rochester, New York? The following guide lists the top dental clinics, what you can expect to pay for a dental implant in Rochester. Click on the profile of a dentist near you to read more about them. Eric W. Ruckert, DDS, Richard C. Edwards, DDS and Michael B. Krzemien, DDS, MD,practice full scope oral and maxillofacial surgery with expertise ranging from corrective jaw surgery to wisdom tooth removal. We can also diagnose and treat facial pain, facial injuries and TMJ disorders, and perform a full range of dental implant and bone grafting procedures. Your smile is our priority. We realize that your oral health is an important component of your entire physical and emotional well being. Our entire team is dedicated to providing you with the personalized, compassionate care that you deserve. We are committed to serving our patients by providing information that helps them to make informed decisions about their oral health needs. This website is a resource we hope you’ll find both useful and interesting. Specialties: Alan S. Cassara, D.M.D. completed his post graduate residency training in Oral and Maxillofacial Surgery in 1981 at Lincoln Medical and Mental Health Center, New York City. Additional studies in Implant Dentistry were completed at the Misch Institute for Advanced Training in Implant Dentistry in Dearborn, Michigan in 1993. He is a Fellow of the American Association of Oral and Maxillofacial Surgery and is board certified by the American Board of Oral and Maxillofacial Surgery.